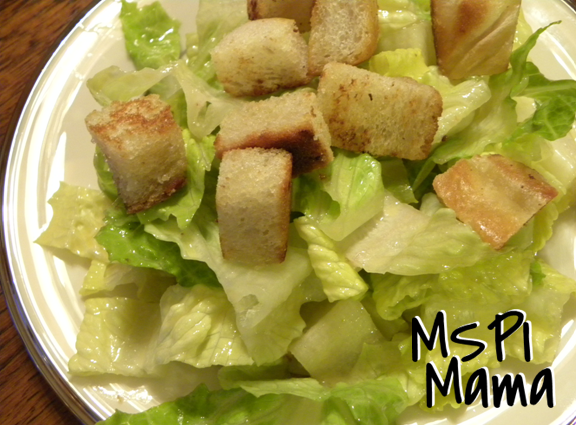 Since I evidently was on a garlic binge for our Valentine's dinner with Shrimp Scampi and garlic bread, I decided to keep the theme going with Caesar Salad. I've been wanting to try a dairy-free version, and this is what I came up with after looking at several different recipes. Now, I won't lie to you, this recipe would be better if it had Parmesan cheese in it, but since that's a no-no, the homemade croutons really help you forget that you're missing something. They are that good! Combine all ingredients in a blender, except the oil and salt, and blend until smooth. Slowly pour in the oil while the blender is running until dressing is smooth and creamy. Turn off machine and taste the dressing. Add salt to taste. At least 15 minutes and up to several hours in advance, in a small bowl, combine the olive oil and the garlic and set aside. When ready to cook, remove the garlic from the oil and heat the garlic-infused oil in a large skillet over medium-high heat. Add the bread cubes and cook, stirring, until golden brown, 2 to 3 minutes. Drain on paper towel and toss with the salt. Allow to cool. Place the lettuce in a bowl and top with the dressing. Toss until all the leaves are coated evenly. Sprinkle croutons over the top. Tip: Leave out the anchovy paste to make this vegetarian.